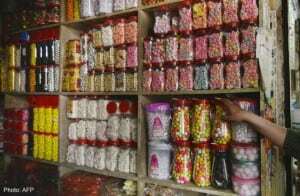 AFP: ISLAMABAD – Fruity sweets and packets of chicken soup that fall foul of halal laws are disappearing from Pakistan’s shop counters as the country looks to clean up its Islamic food credentials to boost exports to rich Gulf states. Shops in Pakistan, an Islamic republic where 97 per cent of the population are Muslims, already do not stock pork or alcohol — with a few extremely rare exceptions for foreigners and the small Christian minority. Now the government wants to crack down further on products using alcohol and pork derivatives as ingredients. So amongst other things, Pop-Tarts are off the shelves in many stores, along with imported jelly, sweets and several European brands of chicken soup. They have been found to contain ingredients banned in Islam such as wine or gelatine derived from pork, or extracts from chickens not killed in accordance with Koranic doctrine. There is so far no extra obligation on shopkeepers to pull products from the shelves, but some have decided to act. “We heard about the new rules and decided not to take any chances,” one Islamabad shopkeeper told AFP. Other shopkeepers are putting up signs warning customers to check the ingredients of imported products carefully before buying. Some are even quietly telling customers not to buy certain products over fears, sometimes misplaced, that they contain banned substances. A draft law seen by AFP and due to be scrutinised by lawmakers in the coming months plans to sort out which products are halal and which are not, and set up an inspection service. The aim is to create a Pakistani Halal Authority with the goal of boosting food and agricultural exports to wealthy Gulf states. Pakistan has been undergoing a process of Islamisation since the late 70s, but it is a late arrival to the international market for halal products that has been growing in recent years and is estimated to be worth up to $700 billion worldwide. “Now there is awareness about (halal), people go through the composition, the contents. Earlier, the awareness was not there, nobody was aware of this non-halal contents,” Mian Ijaz, a senior official at the Ministry of Science and Technology, told AFP. The science ministry is taking the lead on the bill as it has laboratories for testing products. One of the architects of the proposed federal halal authority, retired judge Khalil-ur-Rehman Khan, said the plan would mean products were clearly labelled and should give Pakistani shoppers peace of mind. “Anyone importing for instance chicken from sources that are dubious or which people have doubt, like from China… will have to have accreditation from the authority working under the Pakistan Halal authority,” he told AFP. However the main aim of the project is not to restrict imports, but to boost exports. Lying at the crossroads of the increasingly wealthy Muslim countries in Central Asia and the rich Gulf states, where demand for halal imports has boomed in the last decade, Pakistan is well-placed geographically to increase its export in, for example, meat. “Pakistan has all these markets available… as far as shariah compliance is concerned credibility of Pakistan is already there — what we have to ensure is only the quality,” Khan said, calling for the creation of a recognisable Pakistani halal-certified logo. Zubair Mughal of Pakistan’s Halal Research Council agreed, saying the country has the products and a strong Islamic reputation but needs better “halal branding”. “The top 10 exporters to the Middle Eastern market, the main halal market, they are not from Muslim countries,” he said. “Among the top 10 there is no Muslim country,” he added, noting that Australia, New Zealand, Argentina, Brazil, Russia, France, India and Thailand are all among the top exporters. Under the proposed law, all food exports will be tested by certification agencies under a national halal authority — partly a way of undercutting clerics who have set themselves up as lucrative halal-checkers. Inspectors will be set up to make sure no-one produces fake halal logos or sells products that do not conform to the new legislation, with wrongdoers facing six months in jail or fines of up to $6,000.